The London Jazz Festival is currently in full swing and I have been very much looking forward to seeing one of my favourite living pianists, Brad Mehldau playing with his trio. I was keen to combine the concert with a trip to the Tramshed for a quick and simple roast chicken. In theory this should have been a great night, but unfortunately both meal and concert were a bit of a disappointment. Mehldau was not on great form, he seemed hunched and hesitant, his improvisations were aimless and often fell flat. His celebrated bassist Larry Grenadier held the show together, although I think his 10 minute bass solos would have been a tad rich for even the most earnest jazz geek. Mehldau is famous for taking popular tunes, deconstructing them with jazz improvisations and then gently reforming the original idea. The methods employed by Mehldau are not dissimilar to Mark Hix’s approach as a restaurateur – he is adept at simplifying cooking styles and cuisines, boiling them down to the bare essentials then repackaging them as a trendy new concept that the masses flock to. His style has reached its logical conclusion with Tramshed, a restaurant that only offers two main courses: chicken and steak. The restaurant’s setting is very dramatic and reflects its name: it is a former electricity generating station for trams. The centerpiece of the restaurant floor is a specially commissioned piece by Hix’s friend, the exalted Brit Art charlatan Damien Hirst. The work is one of his Natural History series and consists of a cow with a cockerel on its back, both suspended in formaldehyde (thankfully they are not sliced in two like some of the animals in the series). It is a very arresting image and adds to the already breathtaking setting. On the restaurant’s mezzanine there is also a rather pedestrian Hirst painting of a cartoon chicken and cow (as we see with his mundane spot paintings, if our Damien finds a theme he is quite willing to milk it dry). 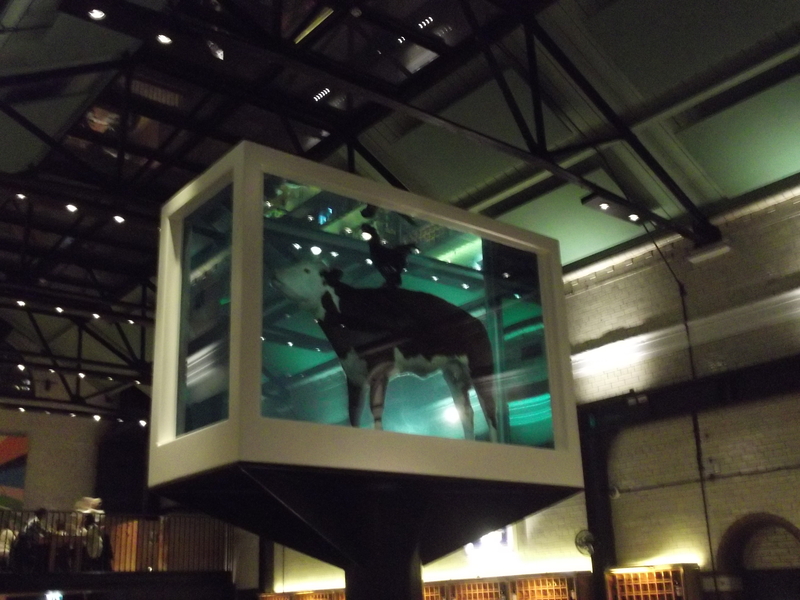 Apologies for all this rambling, but it reflects my inability to write with any gusto about the food at the Tramshed. As intimated earlier, we opted for the whole roast chicken (£25) which comes with chips, gravy and a very tasty bread sauce. There is also a limited range of sides (all £3.95) – we chose buttered sprout tops which were fresh and earthy. 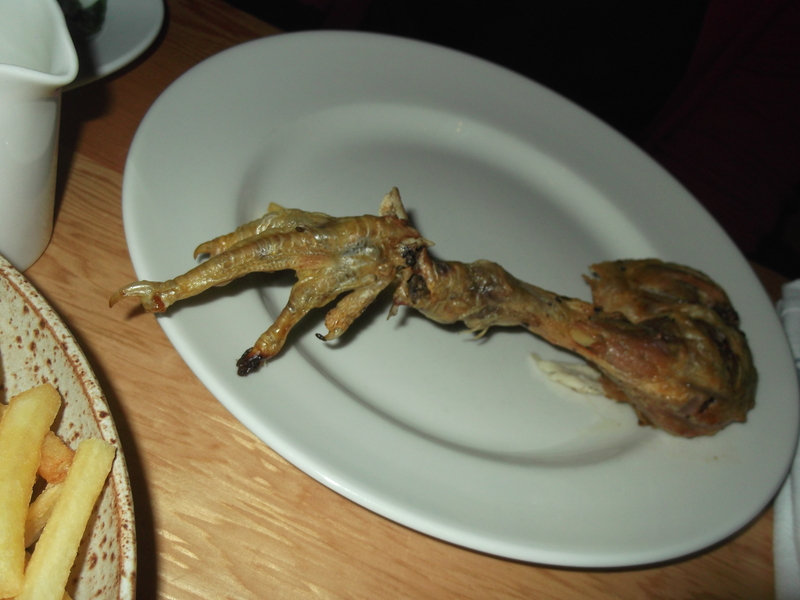 However, the star of the show should have been the chicken and although it was served dramatically impaled on a ceramic stand with its feet fully intact, the bird was rather dry and pretty scrawny. 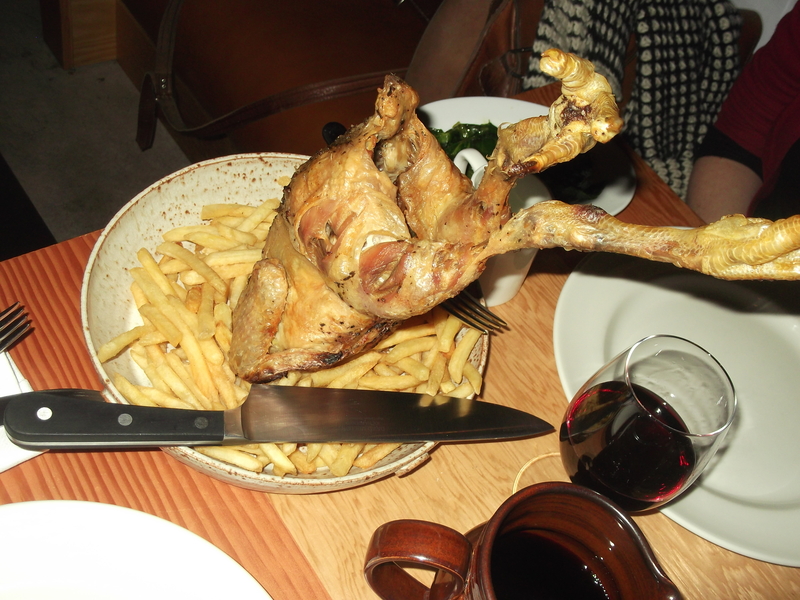 The chicken comes with fries doused in rosemary infused fat which were extremely moreish. We also had a carafe of the house red – a Tempranillo/Syrah blend for an inexpensive £13.50 – from which we extracted 4 medium sized glasses. They offer 20 wines by the carafe which is very handy if you are going for a pre-theatre slap-up meal. The Tramshed promises a lot, it looks fantastic and has well conceived trimmings, but with such a limited menu the main ingredient needs to be cooked with more care. Also see: Martini Mandate, Crump Eats and The London Foodie.